During the three days of non-stop rain, I could not help but think of the less fortunate ones who have to sleep (or not sleep) with the fear of knowing the floods are rising and were constantly getting wet from the rain trickling on their roofs, or worse, living under terrible conditions in evacuation centers. Then because I'm on a worrying roll, the wedding addict in me thought of yet another concern: Paano na ang mga ikakasal sa araw na 'to?! (What happens to those getting married in this weather?!). 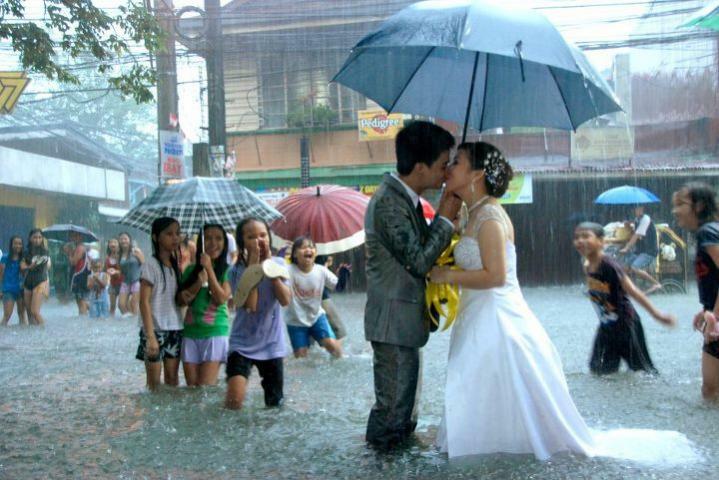 Apparently, no storm can dampen the spirit of two people madly in love. Usually, it's just the bride who does a thrash the dress/gown session. But for this one, both of them had no choice but to do an impromptu trash the wedding outfits because of the floods outside of the church. Nevertheless, the rebel in them kept their spirits waterproof (borrowing from the line "The Filipino spirit is waterproof") and their love for each stronger as they battled their very first storm (albeit literally). Do you know of anyone who pushed through their wedding despite the habagat? Share them with us!